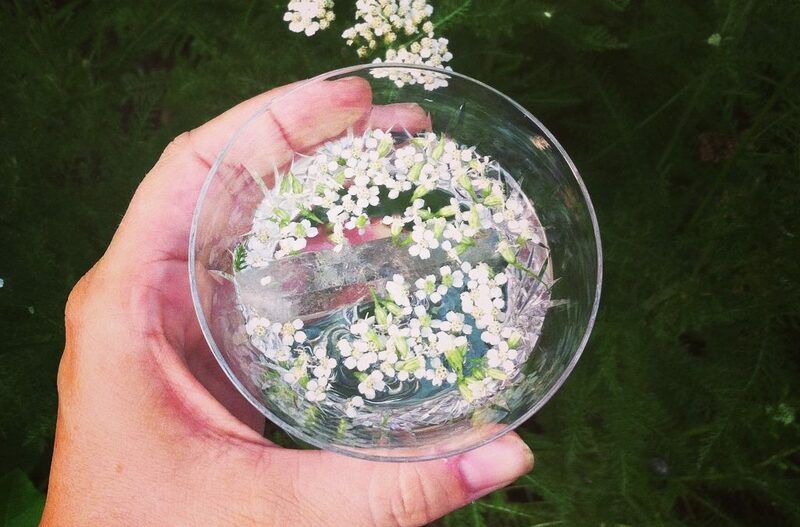 Yarrow Flower has an amazing ability to ease the mind and spirit. When I allow myself to take a few small moments in her presence, I feel safe and secure. The virtues of Yarrow are many. On a physical level, Yarrow works with our bodies to circulate the blood, break up stagnation, and create movement back to source. This action of circulation and re-circulation increases the body’s ability to heal from wounds, assists with stimulating stagnant menstrual cycles, and is helpful for massaging out knots and areas of tension in our shoulders, neck and back. Yarrow also offers astringent properties that stitch together the tissue of the skin. In wound care, this contributes to Yarrow’s ability to help stop bleeding and speed the healing process of cuts and scrapes. In skin care, this action has a great ability to reduce wrinkles and bring a youthful glow to the face. A bit of yarrow infused oil on the feet causes a profound sensation of opening and releasing, while a drop or two Yarrow essential oil on the abdomen has been known to expel parasites and cleanse the gut. Yarrow offers similar properties to soil, by clearing out toxins and strengthening the vitality of the soil she grows in. What do the physical actions and properties of Yarrow tell us about her spiritual-emotional gifts? Nature provides us with a guide map to understanding the secret language of flowers, fondly called the doctrine of signatures. When we look at a flower and note its appearance and physical characteristics, we begin to see into her world. Yarrow grows tall and somewhat bushy, with feathery soft leaves growing from a thick strong stalk. At the top of the stalk grows the flower, in an anvil or umbrella style. Her flower head consists of several tiny white blossoms weaved together as one. A tiny burst of yellow rests inside each little white flower. She grows wild in fields, beach dunes and along city blocks, blooming in time with her friends St. John’s wort, Queen Anne’s Lace, and Mugwort. Taking into consideration her appearance, I see a white umbrella of light, sheltering us from emotional-spiritual toxins, and providing us with a bright arc line from which to attract more light into our lives. With her tiny yellow center, she activates our solar plexus and will power to use our power in service to the light. As a flower essence, Yarrow assists with stitching together our aura, repairing rips or tears. With a strong aura and arc line we feel a sense of energetic power and protection that carries us through our days, allowing us to feel confident and effective. 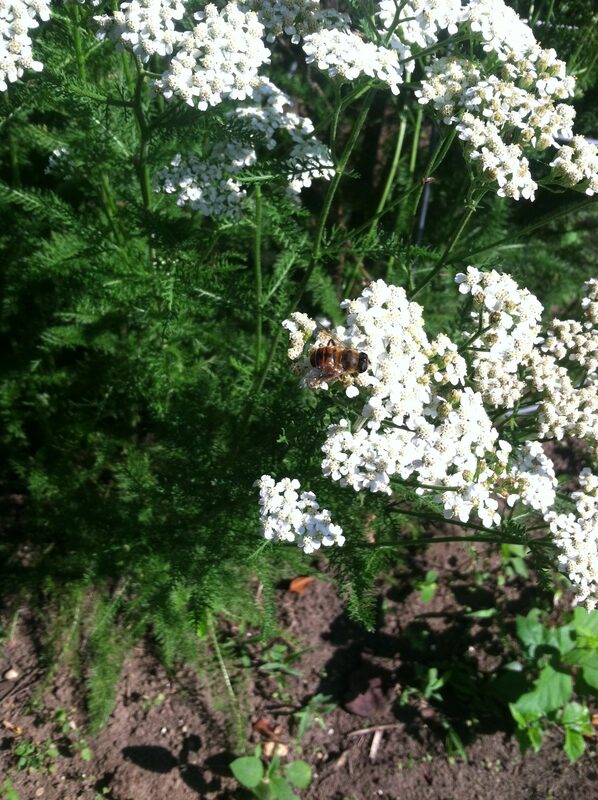 Yarrow’s ability to cleanse toxins and parasites from the soil and our bodies translates to our Spirit as well. When we embody Yarrow, we turn our face towards the Sun, receive the love of God, and use it to purify our mind, heart, and soul. When we feel encumbered by dark energy, Yarrow helps us shelter ourselves from the storm. She demonstrates how to circulate pure white light from Spirit, sharing that we are most protected when we are at our most open and vulnerable states. We cannot properly circulate and transforms toxins in our environment and within ourselves when we are closed off, building a wall up around our hearts, or slumped over. It may seem counterintuitive in a fast paced, dog eat dog world, but what Yarrow has shared with me is that when we are most open and vulnerable, we have the best ability to heal and protect ourselves, due to our openness to receiving and sharing purity of light. Looking at Yarrow’s ability to circulate the blood and stop or start bleeding (depending on which is needed at the time) we see the depth of her emotional intelligence. When we become stuck in a wounded stare or full of toxins, we need to circulate what we have taken in with purity of spirit from within and around ourselves. As we tap into the current, we clear all that we have absorbed. Like a river of moving water, we constantly feed all energy back to its source, where it becomes filtered and renewed once again. Yarrow is a beautiful ally for those who wish to help others who are living in the dark. She assists the healer in remaining open and effective, while maintaining strength in boundaries so he or she is not “taking on” the emotional burdens of others. When we remain in this state of open protectedness, we are able to shine the light of love and compassion onto others, triggering a deep healing response for all involved. Yarrow Plant Spirit Medicine is an essential for those who are highly empathetic or those working in the helping profession, especially with those in less than optimal environments. Yarrow can be helpful for the “wounded healer” or those who work in helping professions such as teaching, social work, social reform, prison workers, city dwellers, and just about anyone who wishes to remain open, yet protected. Turn your face to the sun and become ablaze of white! Go forth and share your light! Yarrow pairs well with other heart opening and energy moving herbs such as Mugwort and Rose. Much Gratitude and Yarrow Blessings to All!